Over the last six months we’ve heard quite a bit about Vevo, a premium content site that’s been called a ‘Hulu for music videos’. The site was originally founded by UMG in a partnership with YouTube and has since added Sony Music Group, with negotiations onging with EMI and Warner. But while plenty has been said about its partners, we still haven’t seen much that shows what the site actually looks like. Today it looks like Vevo decided to peek out from under the covers, though its appearance was short lived. Our tipster noticed a number of artists who had apparently been given Vevo-linked YouTube accounts, with names like EminemVEVO and DonnaSummerVEVO. 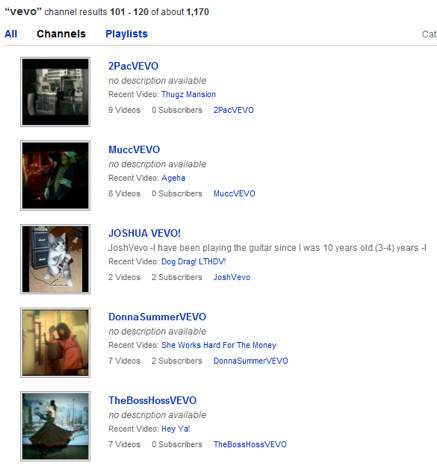 Videos from these users look nearly identical to the music videos scattered throughout YouTube, but with one key difference: there’s VEVO branding on the bottom right hand side of the player. Clicking the VEVO logo attempts to kick you to a page hosted on VEVO.com, though the links are all broken. At least, they were. As I wrote this post, YouTube has apparently noticed the videos and taken them down. So does this mean that the VEVO launch is imminent? Probably not. A source we’ve spoken to says that this probably isn’t part of a large roll-out or launch, but that’s it’s more likely that someone stumbled across a video they weren’t supposed to see. The site is reportedly shooting for a December launch. And of course, this doesn’t really give an idea of what VEVO proper will look like, but it may give us some idea of what VEVO content will look like when it’s watched on YouTube. So far, the branding seems to be pretty minimal, though we may well see more skinning and ads on these clips once VEVO actually goes live.